It is three square feet and easily disassembled without using tools. The legs are bolted onto dividers using wing bolts. The sub-table is great for holding phones, food, and spare game pieces, while keeping the main surface clear for playing games. The surface is removable/reversible, with different designs on each side. 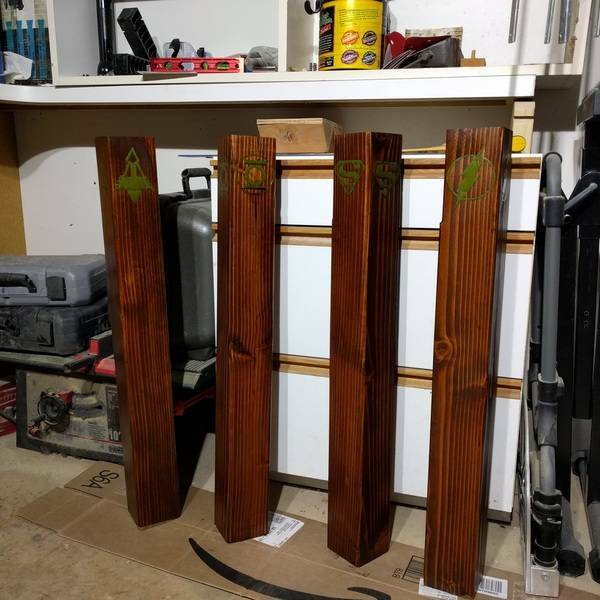 I used painters tape to create positive/negative designs with wood stain. The game boards are to be used with wooden marbels and I routered out the holes with a round nose bit. I then covered the surface with several coats of polyurethane. The game board patterns on the surfaces are "Aggravation" and "Chinese Checkers". 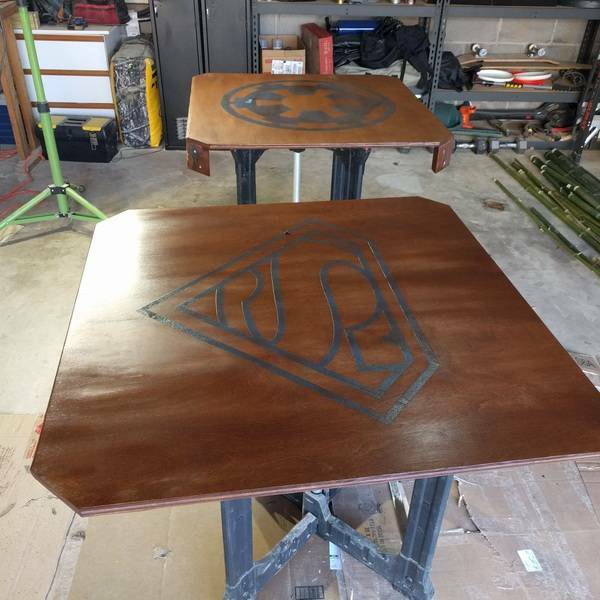 The decorative patterns are Superman and Imperial. Each leg has a unique symbol so its easy to match up during setup/teardown. Thank you! 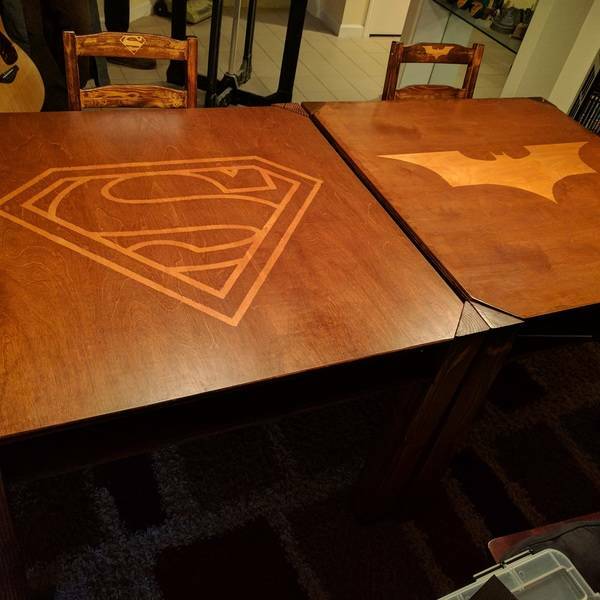 I have greatly enjoyed the multi-use functionality of these tables! 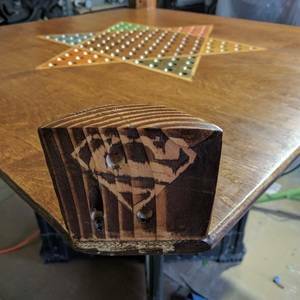 The painters tape trick is a very cheap and easy way to get the look of inlay. 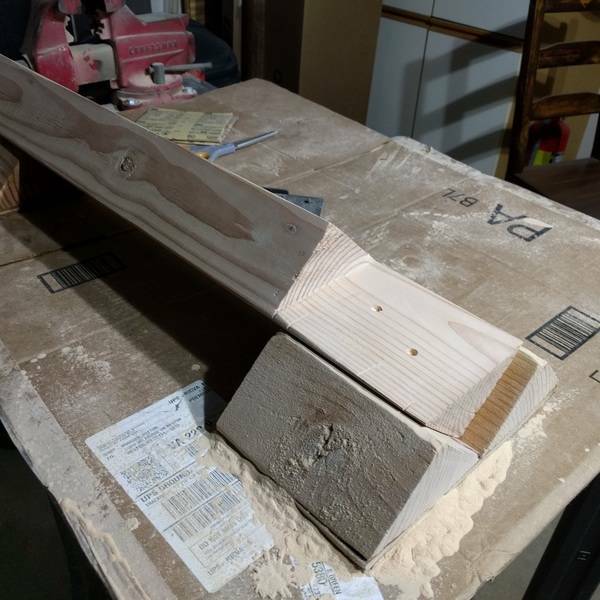 I use it on almost all of my furniture projects now. This is so impressive! We have never seen anything like it! Awesome job! Thank you! This table is my own design, and I've really been happy with how it turned out! That's Awesome! Great job man! The hard work you put into this is very evident. Keep it up! Thank you! And thanks for the follow, I will keep posting things as I make them! Awesome design, really like the double table surfaces and the reversible top! Very independent thinking using both sides of table. Thinking of using same color & size of marbles. Good job thinking outside the box. Innovation Telsa needs engineering like you. Very original and colorful. 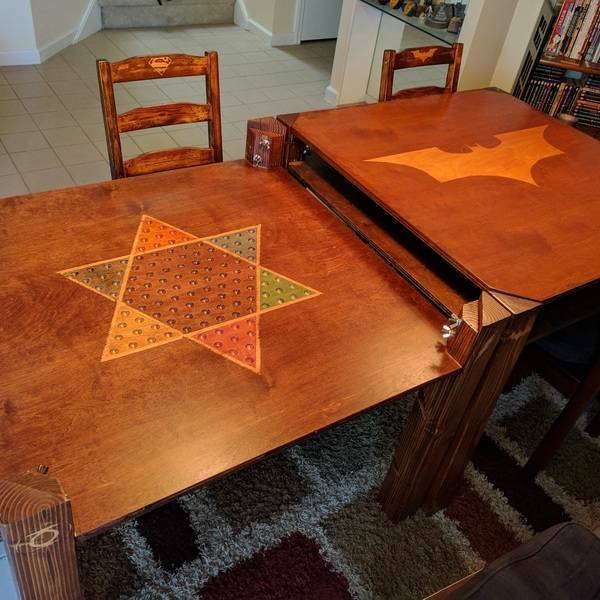 This is a matching set to my previous Batman Fliptop Gaming Dining Table. 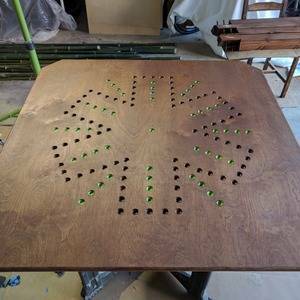 I designed and built this double-decker table for the dual purpose of eating and playing board games with friends and family It is three square feet and easily disassembled without using tools. The legs are bolted onto dividers using wing bolts. 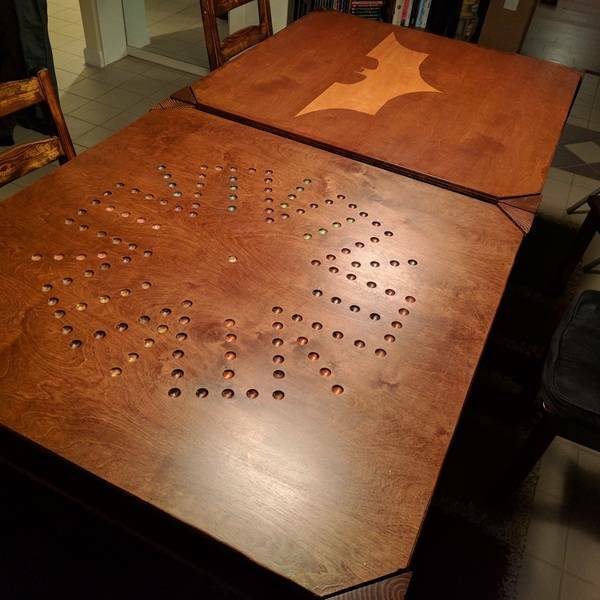 The sub-table is great for holding phones, food, and spare game pieces, while keeping the main surface clear for playing games. The surface is removable/reversible, with different designs on each side. 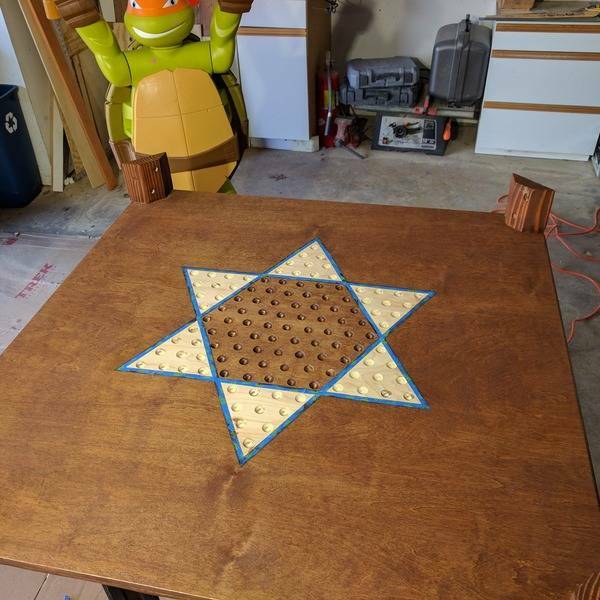 I used painters tape to create positive/negative designs with wood stain. 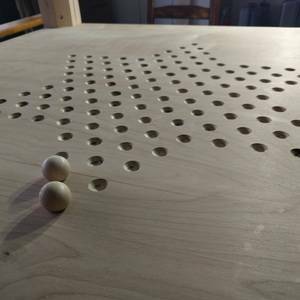 The game boards are to be used with wooden marbels and I routered out the holes with a round nose bit. I then covered the surface with several coats of polyurethane. 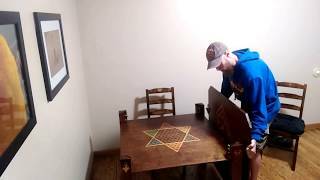 The game board patterns on the surfaces are "Aggravation" and "Chinese Checkers". The decorative patterns are Superman and Imperial. 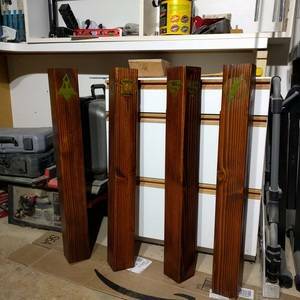 Each leg has a unique symbol so its easy to match up during setup/teardown.